Giving your dog Pup Corn Plus Cheddar & Parmesan Flavor Dog Treats is sure to make your pet love you endlessly! Pup Corn Dog Treats are low calorie, low fat, and low sodium. This treat is a light, in between meal snack that isn’t too heavy on your dog’s stomach! 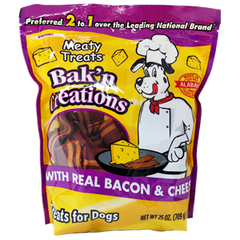 With a delicious taste that your dog will find irresistible, these crispy, light treats will satisfy your dog’s cravings so that your best friend is content until the next meal to come! Corn flour, chicken, natural chicken flavor, powdered cellulose, cheddar cheese flavor, parmesan cheese flavor, chicory root, canola oil, mono and diglycerides, artificial color (yellow #6, titanium dioxide), lactobacillus acidophilus fermentation product dehydrated, bifidobacterium animalis product dehydrated, lactobacillus reuteri fermentation product dehydrated.